When training Alchemy on alts I'd prefer to have a reference to the effects of each reagent before they are known, so I made this as an aid. 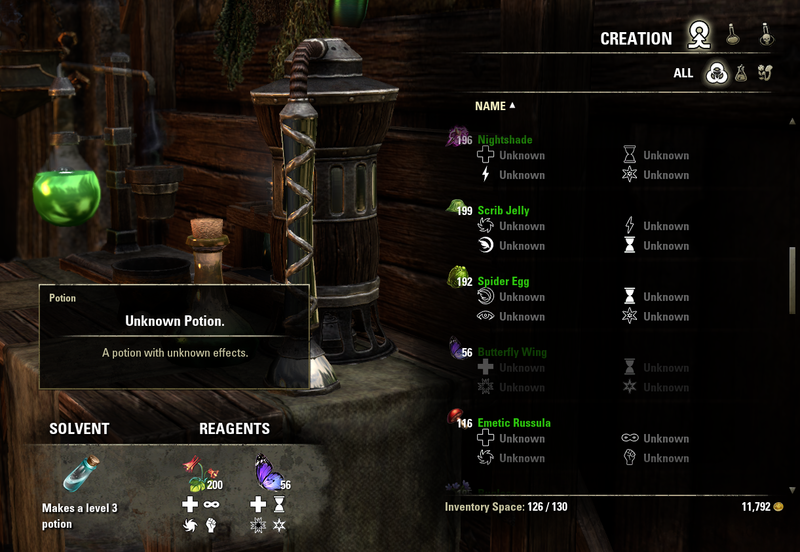 It simply shows the effect symbols on each of the reagents in the list and when slotted for potion creation. It leaves the names as "Unknown" so that you can see what you still need to learn. It is completely compatible with Potion Maker and I still recommend using Potion Maker for its useful recommendations on what to combine. The issue is that there isn't a reliable and consistent way of knowing if you know those two because ZOS has moved away from adding achievements for such things. I've request a means of being able to track this, but until then, I'll just disable the check so it works. It's odd though; none of my charas knows any of the four traits of those two ingredients - Clam Gall and Powdered Mother of Pearl - yet, with the addon active on all charas, the effect symbols were showing up on my lower level charas, but not on my champion level chara. Anyways, I don't know what you've changed on the new update but seems to have worked! The effect symbols are finally showing up on my champion level character. My many thanks! What does that character know? No error, just the effect symbols not showing up before the unknown status of the ingredient. I'm only missing the effects of Powdered Mother of Pearl and Clam Gall on the chara I'm having this issue with. Thing is, those effect symbols show up on my other charas... Could it be due chara level? My other charas are levels 4, 6 and 15 respectively, while the chara I'm having issues with is already level 50/Champion 118. Last edited by ibluecat00 : 09/28/18 at 09:31 PM. Turn off all other addons, then turn them back on in groups of 5. As soon as you have an issue, disable those 5 individually until the issue goes away. I followed your instructions and, oddly enough, this issue only seems to happen with one of my characters. I've tried to uninstall and re-install the addon but the issue persists. Any suggestions? I can't seem to get it to work. There must be some incompatibility of some sort with my addons list. Any tips on how I may figure this out? I really like this addon. Nice. 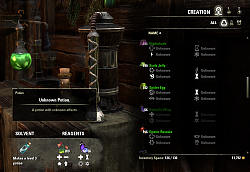 Now I don't have to waste one of the new reagents hoping I combine it with the right ingredient to learn it. Great mod, does exactly what I was looking for ! Thank you !